Early attempts to improve depth of field in cameras include reduction, as well as other manipulations of lens aperture, But with limited success. The FocOz system is based upon an entirely different principle, namely combination of several differently focused frames of the same scene. The history of this technique goes back to (at least) the early 1980's: A purely optical attempt in this direction (which we saw working) is described in US Patent 4,741,605, applied for in 1983. Inventors were well known Swedish entertainer, film director etc. Hans Alfredsson et al: It was a movie objective which could be focused upon two different distances from the lens, at the same time. The good news was that a film maker could now focus upon - say - two different actors. The bad news was that this optical superposition of images included not only the high resolution part - but also residual blurred image contributions, which latter part reduced image contrast intolerably. So the question arose about how to get rid of such blurred components. The early dawn of electronic camera technology gave an answer and relevant lab experiments were reported in Applied Optics 15 May 1983 p1149 [Pieper, Korpel]. One principle attempted, was to filter away the blurred image 'parts' by electronic means, exemplified (1984) by United States Patent 4,661,986. (Burt, Adelson & followers). It meant reduction of blur. Another method is to divide these differently focused frames into small image parts, compare every such little segment with its equivalence in the other frames, select the best focused ones and reject the (blurred) rest. The selected image parts are finally reassembled for a mosaic resultant picture. It sounds simple but it hinges on how to measure 'image sharpness' of each little part correctly. One straight-away method is to use a well known Auto Focus (AF) principle, stating that Maximum image contrast equals best focus. 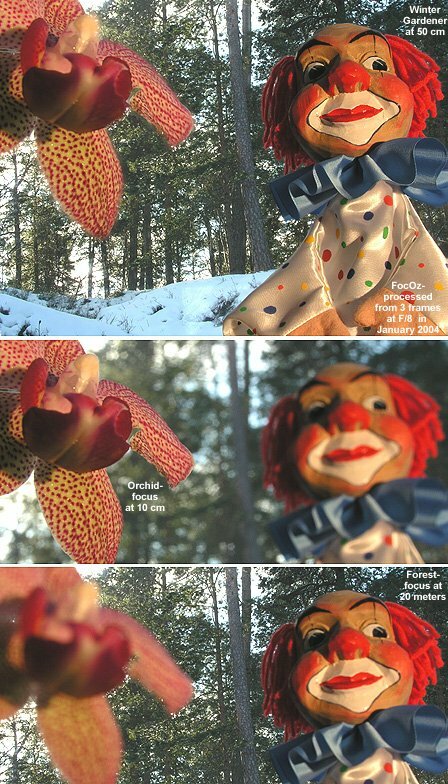 This Autofocus procedure may thus be applied to each individual little picture part, but disturbances (artefacts) may still occur along edges dividing the scene into areas of different focus ranges. Methods to detect such edges by means of Laplace operators and similar filters were described, however obviously of little avail where motifs are lacking such edges. Attempts during the 1990's were apparently restricted to black and white pictures of relatively small size. And there wasn't generally enough computer power for the task, in those days. Struggles against these kinds of problems may well be a reason why infinite depth of field cameras didn't see the light of day during the 1990's, even though some progress from microscope and missile applications were reported. So this was the situation around AD 2000, when we started to develop our FocOz camera. It wasn't that easy. Regular photography of landscapes involve objects with very little contrast to measure - like the sky - so we had to invent new techniques for the FocOz camera. Pixel-contrasts in certain program- loops are not even measured between individual picture-pixels, but rather against local intensity averages. Furthermore all colors are included in one single algorithm, in effect improving the spatial signal to noise ratio due to increasing the number of pixels participating in a calculation. We also considered the fact that frames can be out of focus, relative each other, to a variable degree. Two frames registered through a FocOz tele-lens are usually featuring a larger focus difference than in wide angle mode. Here comes (no retouch!) another FocOz animation where the two focuses are differing so much that each Mexican figure tends to 'disappear' when out of focus! Remember: It's a full size 5 Megapixel image, processed with all RGB colours in one run, with our standard 2,0 GHz PC (Windows XP) computer. It took about two minutes. Can you wait that long until you have ordered your own FocOz camera from us? It's hard to be a soothsayer - about the future and Depth of Field in particular. Those FocOz features suggested (below) are not in our sleeves, but rather in our heads - i.e. described in our patents (Application Numbers PCT/SE01/02889 and PCT/SE02/01934). It's not likely that you will encounter such FocOz cameras on the market in the next few years - just mentioning it, in case you consider upon sitting down and wait for it. But we believe this is only the beginning. For example, the FocOz technology can readily be applied to video cameras. And it's quite feasible to make cameras where differently-focused frames are shot simultaneously, so that you may, indeed, record FocOz pictures of very fast moving objects. It's also possible to apply the FocOz depth of field technology to the camera viewfinder itself, so that you may (visually) compose your motif without any focusing forth and back. In fact no initial focusing whatsoever will be involved if a set of optimal focuses is predetermined inside the camera. And the future image processing can be allocated to the camera itself. It will then be time to bid old Autofocus goodbye in some standard consumer- cameras: Just press the button and out comes Infinite Depth of Field photos!